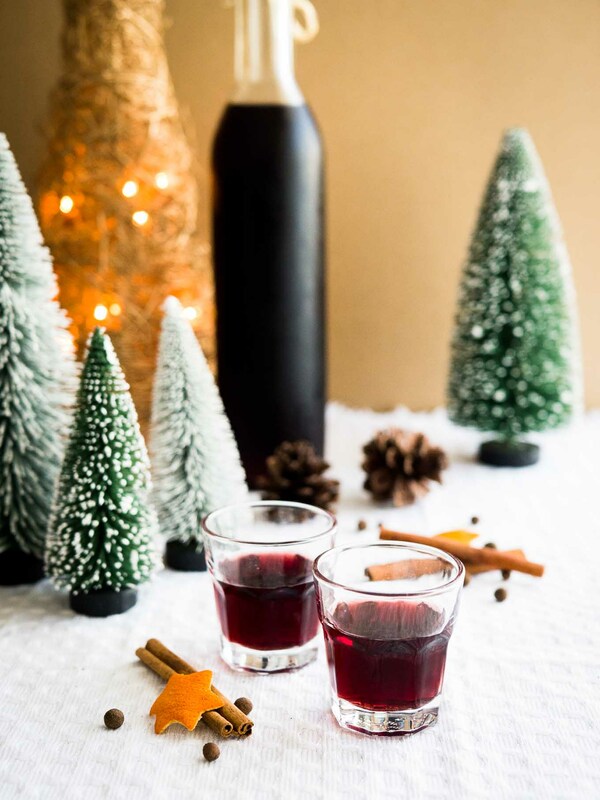 This easy mulled wine liqueur makes a perfect Christmas gift! 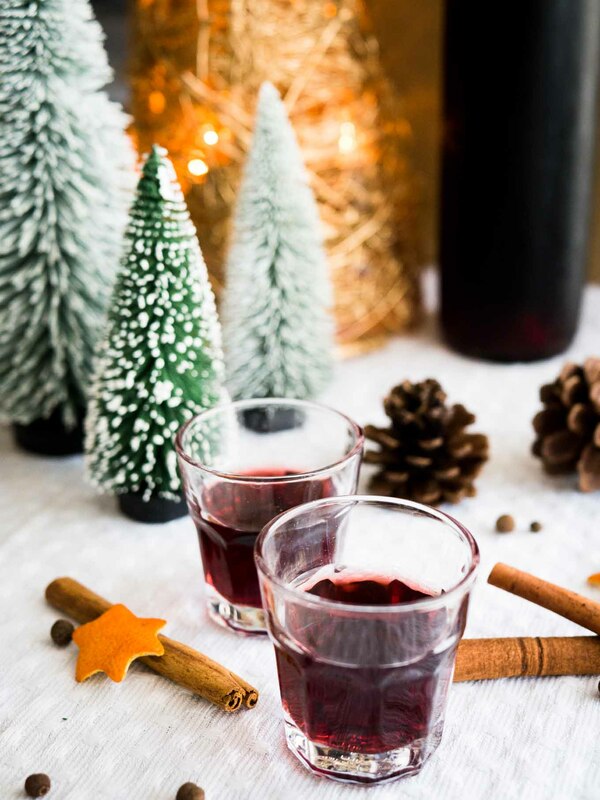 Dark rum and red wine are infused with mulling spices, making this homemade drink as festive as the holiday season gets. You might ask yourself, didn’t she say she doesn’t like mulled wine and much prefers the non-alcoholic version?! Yes, I’m still preferring my Spiced Grape Punch which is made with grape juice instead of red wine. 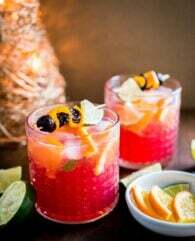 It’s a perfect holiday drink which everyone can enjoy and it tastes sooo good! Something about hot red wine makes me feel dizzy so the non-alcoholic version is my go-to Christmas market drink. But this easy mulled wine liqueur is served cold instead of hot which pleases me much more! It’s a perfect after-dinner-drink and it makes a great Christmas gift. 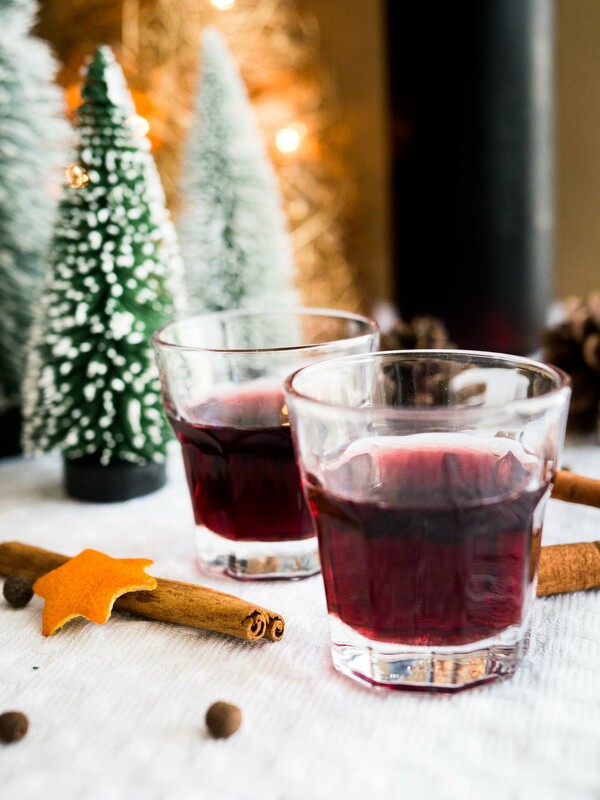 This easy spiced wine liqueur recipe is really easy and fast to make! You only need 10 minutes to make it from scratch and your kitchen will smell amazing. 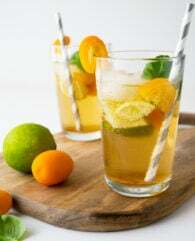 All those Christmas spices are making this chilled drink as festive as the holiday season gets!
. 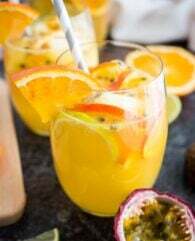 It’s a really easy recipe that makes a delicious festive beverage that especially my husband loves! Liqueur or schnapps is made from distilled spirits like rum, vodka, or gin that have been flavored with e.g. fruit, cream or herbs and bottled with added sugar. In contrast to liquor which has usually a higher alcohol content liqueur is sweeter and is more of a syrupy consistency. For this festive liqueur, I use rum and red wine. 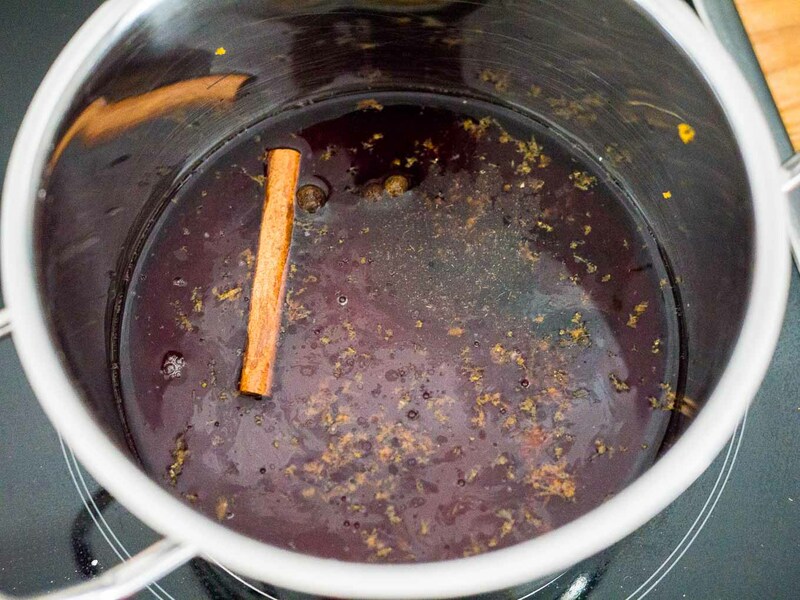 The red wine together with the mulling spices and orange zest adds the typical mulled wine flavor. 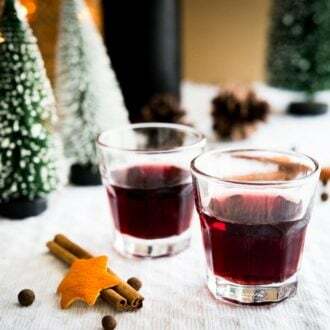 To make this mulled wine liqueur we start with grape juice, confectioners’ sugar, and mulling spices. Let this mixture simmer for a few minutes. It will smell amazing! After the spices have infused the mixture, turn off the heat, and add the red wine and rum. Pour everything through a fine-mesh strainer to get rid of all the little bits and let it cool down. 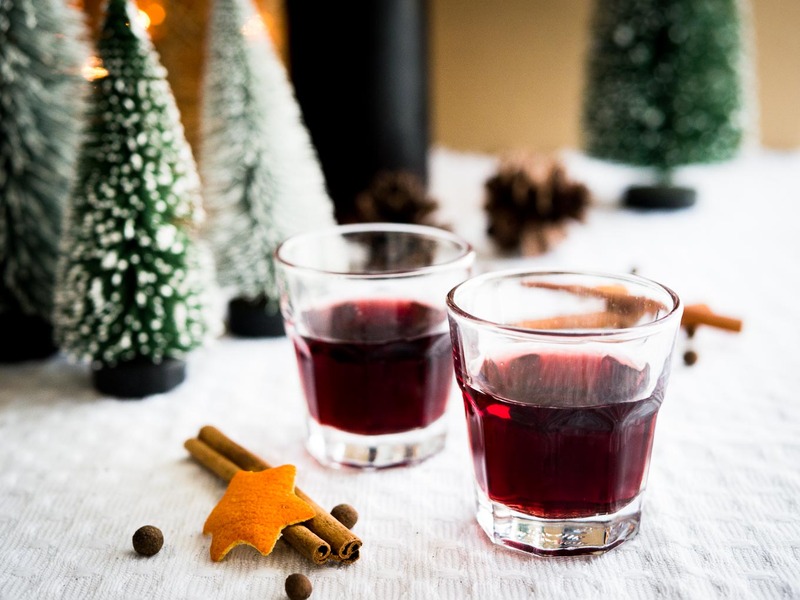 This mulled wine schnapps tastes best chilled! In a big saucepan combine confectioners' sugar, vanilla extract, grape juice, orange zest, cinnamon stick, cardamom, and allspice berries. Let it simmer at a low temperature for about 10 minutes. Take off the heat and add red wine and rum. Whisk until combined. Pour through a fine-mesh strainer and fill into two or more bottles. Makes about 4 cups. Let cool down completely and chill in the fridge before serving. You can store the bottles in the fridge for up to two weeks (after that the flavor will get less). I am a huge fan of edible (or drinkable) Christmas gifts and this mulled wine liqueur sounds like a perfect gift idea!